So it seems it slipped my mind to post these maps up. They were created for Wayfinder #3 (a long time ago) and are free for people to download for their own use. I tend to stick to battlemap scale maps for my fantasy map packs as I feel those are the most useful. If you’d like to see maps like this as map packs – let me know in the comments. These are free for personal use. Feel free to download and share around under the CC-BY-NC-SA license. Who know, a series of islands and a fortified town on the water might be just what you need for the pirates in your Skull and Shackles game! And yes, I love maps at these scales. 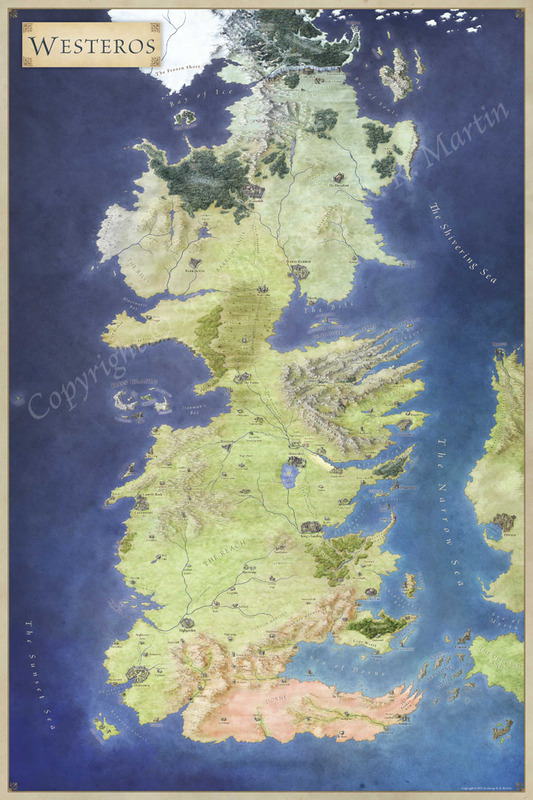 Been seeing alot of your work off MapTools.Love your work.Might even have a custom map job for you later next year.But these are greta as freebies.Again very nice work. Thanks. I’m really glad you like them. 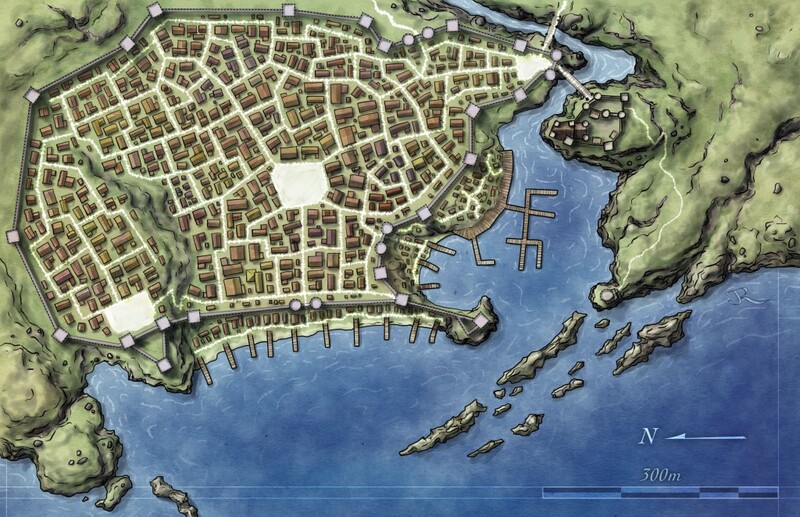 What did you use to make the city map? All done by hand in Photoshop, with a Wacom Intuous tablet. Mostly, this one just took patience! Please let me know if you’d rather I didn’t. It’s CC licensed – so you’re very welcome to use it – as long as it’s not for profit. Glad you like it! Here’s a guy claiming he made one of your maps. Thanks for the heads up. That’s somewhat inevitable when you put art on the internet, but irritating nonetheless. I’m on it. Much appreciated. 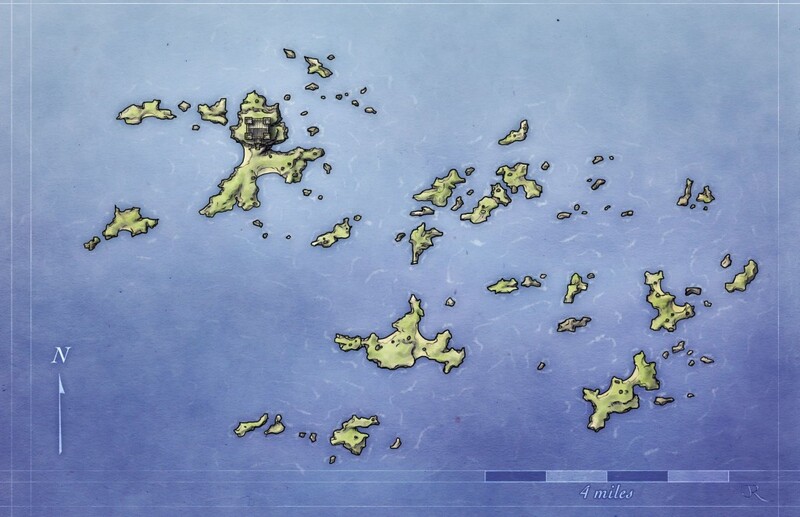 I have used one of your maps as the cover picture to chapter 15 of a story I am writing, email me at JaekovKurosaki@gmail.com if this is not ok.
Also, any feedback on the story would be appreciated if you feel like it. Use for the cover picture is fine – but please add attribution for the image. It’s creative commons licensed, but that license requires: attribution (my name as artist and a link back), that the use is non-commercial, and that you share alike any use of the map. Previous Previous post: More IDW Maps! Now with extra Drizzt.